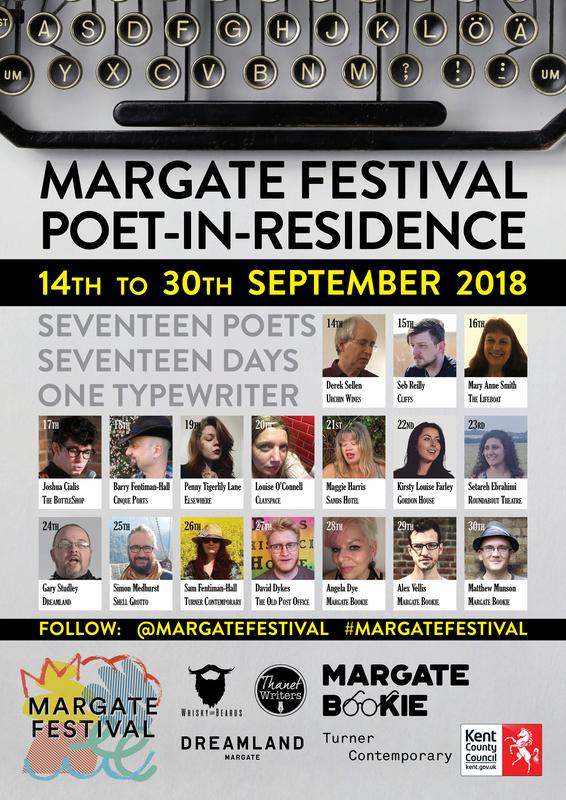 Those who have kept a close eye on our social media will notice we’ve begun promoting the Poetry Micro-Residency scheme as part of Margate Festival 2018. This project sees poets from around Kent partnered with a business in Margate. The businesses provide space for the poet to work, where they might be inspired by the world around them to create new works. This scheme was inspired by the busking poets of Central Park in New York, writing poetry on the spot for passers by. As the theme of this years festival is “NOW!”, this seems especially relevant. This scene couldn’t happen without the support of our partners Thanet Writers and the Margate Bookie, or our sponsors Margate Festival, Turner Contemporary, Dreamland and Kent County Council. For more on the project, please read the articles on Isle of Thanet News regarding the project. For the most up-to-date news, be sure to check our events page. The following are the poets and venues taking part in the Margate Festival Poet-in-Residence scheme. The response so far has been phenomenal. Once the scheme concludes, we will begin assessing future projects of this nature. Previous post Promise Me The Journey Back out now!